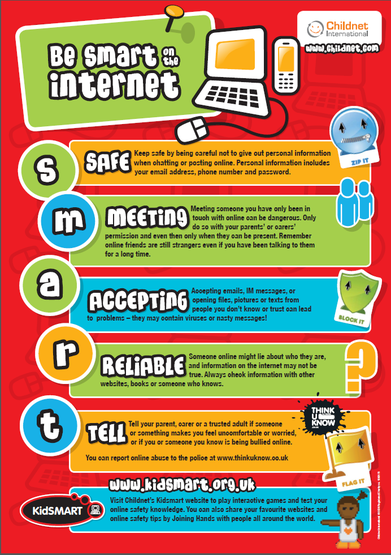 At Cranmore we take the issue of Internet Safety very seriously and on these pages you will find information that will support you as parents/guardians. The internet is a fantastic resource, but it can also bring risks. We work with our pupils in school to help them understand the dangers and learn how to keep themselves safe. SID TV 2019: What is Safer Internet Day? The ‘Click Clever Click Safe’ strategy for keeping children safe online has been developed by the UK Council for Child Internet Safety (UKCCIS). The CEOP (Child Exploitation and Online Protection Centre) logo pictured here is on a lot of social networking sites. It is the Advice, Help and Report button. Clicking on it will take you to their website, where you can easily follow links for help if you are a parent or child. It is excellent, so please try it now!